With More Destinations Than Ever! There are very few times in your life when you are completely free from cares, responsibilities, chores, deadlines, timetables, ringing phones or demanding voices. So the days you spend on a Carnval® vacation are rare and precious. And, because they are, Carnival makes sure they are among the most relaxing, exhilarating, revealing, romantic and fun-filled days of your life. 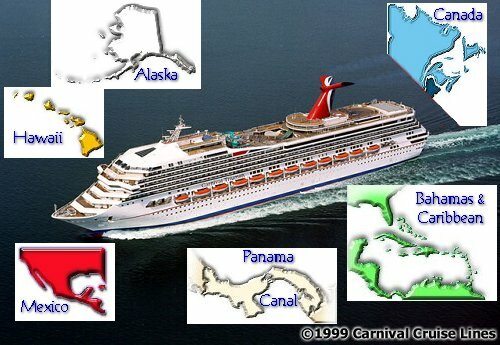 Just look at the picture ~ Alaska to the Caribbean, Carnival's got your dream vacation spot ready and waiting. More ships ~ More Itineraries ` More Fun!! And, just think you're where all your friends would like to be - now that's fun. Now with Live Booking Capability!